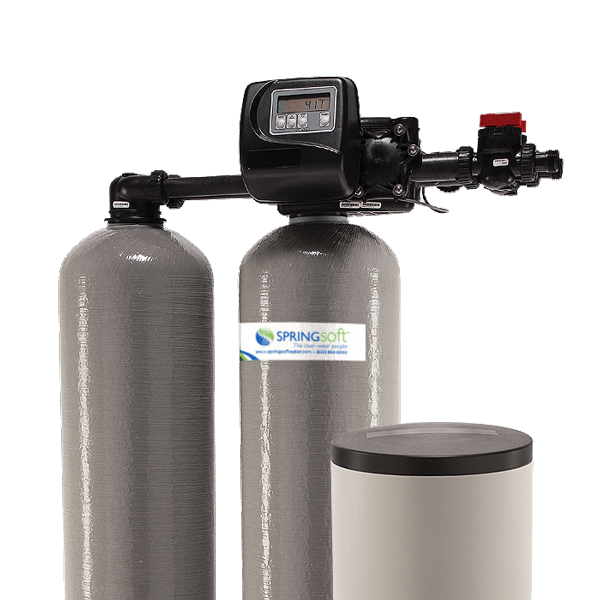 A Springsoft demand twin tank water conditioner will allow you to enjoy the benefits of clean, softened water for your home or business in the most cost effective and efficient manner. 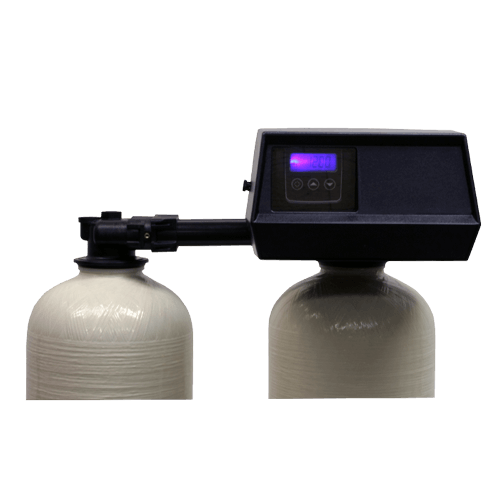 Our pre-programmed control module constantly monitors your water usage to maintain consistent water quality while keeping regenerant consumption at an absolute minimum. The back-up system will maintain time during power outages. Twin tank systems consist of two resin tanks and a regenerant storage (brine) tank. One resin tank is always operational during the filtering/softening process, while a second precharged media tank is in stand-by. Incoming hard water enters the media tank in service and runs through a bed of charged resin beads. Hardness minerals are attracted to the resin beads and the soft water exits the media tank into the water supply. After a certain number of gallons are consumed, the system will recharge the resin beads with a regenerant solution. At this time, water to be treated is automatically directed to the stand-by tank with charged resin to continue the softening process. The alternating stand-by system provides 24 hours of soft water each and every day. Since one resin tank is always operational, raw hard water does not enter the water supply during regeneration as would a single tank system. This approach is extremely valuable for humidifiers, ice makers, boilers or any other water using apparatus that utilizes incoming water around the clock. It also assures conditioned water at anytime without concern for untreated water. Since regeneration time does not have to be accounted for, an appreciable reserve capacity is unnecessary as it is with a single tank system. This allows for complete media tank saturation prior to regeneration, which provides superior regenerant efficiency and environmental friendliness. 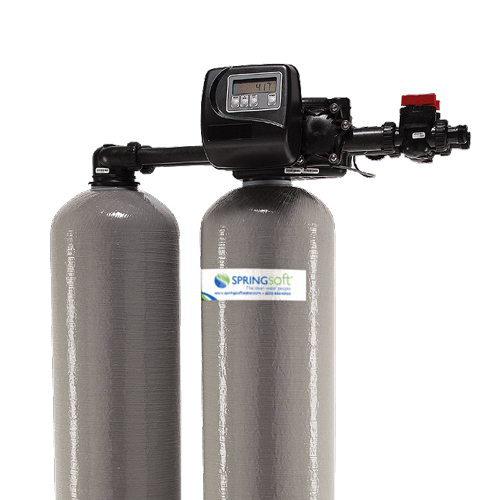 Springsoft twin tank water conditioners are designed to provide years of trouble-free performance and peace of mind. The Springsoft C Series features rugged construction, and a patented drive designed for many years of trouble free operation. Feature-rich and economical, the C Series allows for exceptional flow rate performance and durability. The C Series is a good fit for residential and light commercial applications and for plumbing sizes from 3/4" to 1.5". The Springsoft F Series is controlled by time-tested and proven piston-seal-spacer technology. With innovative features and exceptional quality the F Series offers a wide application range and minimal maintenance requirements. The F Series is a good fit for residential and light commercial applications and for plumbing sizes from 3/4" to 1.5".